OK you can’t tell me that colorful plate doesn’t just get your mouth watering. When I found this recipe, I thought it’d be good…but I had no idea it’d be THIS good. I was really surprised at how much flavor would be packed onto those lil skewers, and it instantly became a favorite of mine. It’s a very simple recipe too (which I like because this is NORMAL cooking and not top-chef cooking). Just stir together the marinade, let the meat sit in it for a while, slide onto skewers, and grill. That’s it. We obviously used pork, but the marinade would also work well for chicken or lamb. What you serve it with is totally your choice, but I highly recommend a fruit salad! We had some orange leftover from the marinade and then just added a few other fruits together. It really pairs well with the flavor of the meat (in my humble opinion). 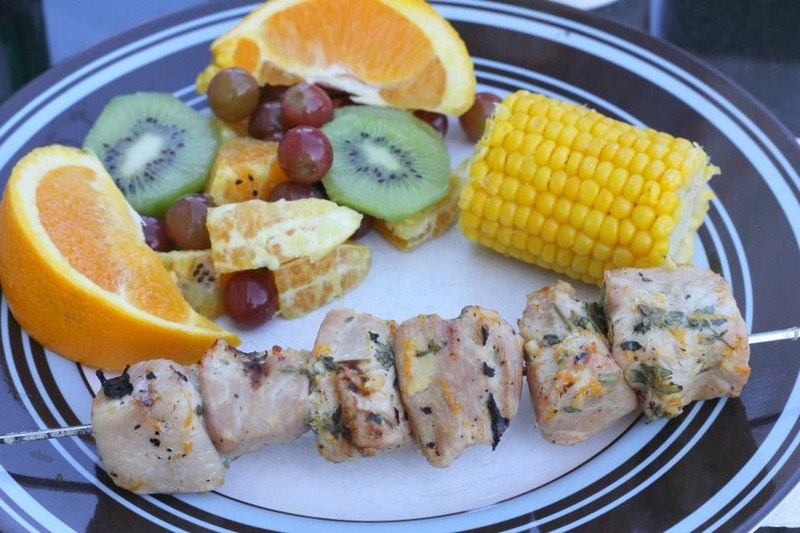 This recipe is definitely a summer grilling must! Whisk together orange juice, zest, garlic, thyme, mustard, 1 teaspoon salt, and 1/2 teaspoon pepper in a large bowl. Add pork; toss to coat. Cover bowl with plastic wrap, and let pork marinate for 30 minutes at room temperature. Heat a grill until medium-hot. Thread 5 or 6 cubes of pork onto each of 4 skewers (If using wooden skewers, soak them in water for 30 minutes before grilling). Discard marinade. Grill pork, turning occasionally, until cooked through and slightly charred, about 12 minutes. Garnish with thyme sprigs, and serve with orange wedges.